Recently on Facebook, Rev. Hans Fiene expressed for his congregation what is true for many like it, and it's well worth the read for all of us who sit in the pews each week wherever those pews may be. Imagine that a couple hasn't been able to get pregnant. For years and years, they pray that God would bless them with a child, and yet it seems that God is not hearing their prayers. Then, many years later, when they figured it was far too late, God opens that woman's womb and blesses the couple with a child. So when that child cries at night, waking up his parents, what does his cry sound like to them? It doesn't sound irritating or frustrating as it might to someone else. That baby's cry sounds like the most beautiful music ever written. Because when that baby cries, that's the sound of his parents' prayers being answered. For many years, there were no little children at River of Life Lutheran Church (LCMS). And throughout all those years, the saints of River of Life prayed that God would bless us to see families with little ones walk in our doors. So when we hear little ones squawking and fussing and crying on Sunday mornings, we're not irritated or frustrated. We're overjoyed. Because that's the sound of our prayers being answered. And I know my congregation is not alone in thinking this way. So parents, don't give up. The more consistently you show up on Sunday morning, the easier it will get. And the more you get to know the folks in your congregation, the more effective they'll be at helping you out. Keep coming. Keep fighting. It's worth it for their sake, for your sake, and for our sake too. 1. This doesn't mean NEVER take your kids out. Most parents are too quick to take them out. But some parents fall off the horse on the other end and think they're displaying a superior adherence to Matthew 19:14 by staring sweetly at the chancel while their kids scream bloody murder. Don't be these parents. 2. If any old folks glare at you or say something nasty, tell your pastor and he'll karate chop them. 3. The struggle is not so much that kids are bad in CHURCH, but that they're just bad in situations where they have to sit still and listen. So don't exacerbate that problem by giving them your phone or an iPad all the time. Read to them more often. Talk with them in the car. When you have to spend ten or so minutes in the waiting room for a doctor's appointment, train them on patience. Stuff like this will help, not just in terms of church, but in terms of their intellectual development as a whole. Personally, I think that's so spot on. I have a soon-to-be 13-year old boy and a soon-to-be 12-year-old girl and can attest to these truths. Besides, the alternative is disastrous and playing with eternal fire, in my humble opinion. 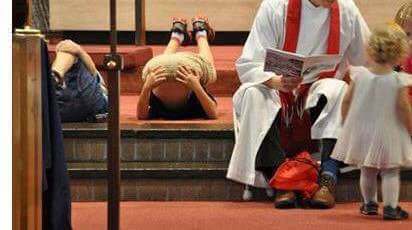 These kinds of children's activities in the chancel don't teach the children about the holiness of the altar and its sanctification by the Lord's sacramental presence. It teaches them instead to treat that which is holy as common. The verb for this is: "to profane." When the children's "altar call" would be announced, Leo would look at us with a combination of horror, revulsion, and the plaintive withering look of, "I don't have to do this, do I?" We would look at him with a discreet and reassuring gesture to stay put, and he would be filled with relief. He knew that this was simply wrong. Interestingly, I often find that the people who like 'object lessons' eschew things like bells, vestments, icons, candles, and incense. I often find that people who like 'hand motions' and bodily gestures for children don't teach the little ones to cross themselves, bow, or genuflect. This is why our Lutheran confessions so often repudiate 'novelty' in worship. We need to teach our children not to participate in spectacles like this. The natural progression from an approach, behavior, mentality, and practices like these are things like so-called "Youth Ministry," "Youth Pastors," and "Youth Groups" not to mention "Youth Sundays" and "Youth Led Worship Services" even! Sadly, these doctrines of men are not helping, but hurting the Body of Christ and are some of the reasons why our children are leaving Christ's Church. 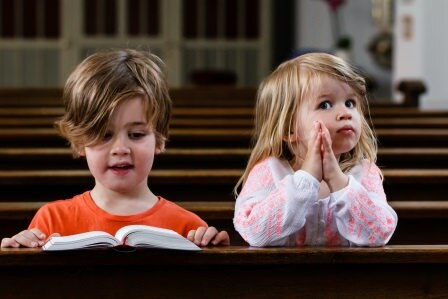 Here's a novel and radical idea: Teach your kids the truth at home first and don't give in to the peer pressure to participate in such things, which is becoming far too common within our churches today (it's not "cute" and "harmless fun" either). Better yet, pick up a copy of Pastor Gaven Mize's "My Little ABC Liturgy Book" too. In a Lutheran layman's terms, these are some very wise words about the importance and necessity of having kids in church and about having them be a part of the Divine Service properly and respectfully as is age appropriate.